Right hooks are one of the most well-known crashes among road cyclists. Many of us have experienced close calls, or worse, with this crash type. It takes only one person to avoid a crash. Let it be you. 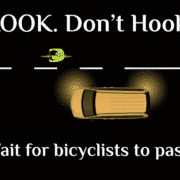 In CyclingSavvy courses, we teach cyclists to recognize situations in which they are vulnerable to right hooks. 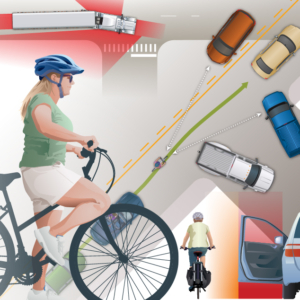 We teach countermeasures to discourage motorists from hooking them, and emergency maneuvers to reduce or avoid impact in the event those countermeasures fail. This year we’re creating educational materials for motorists. It takes only one person to avoid a crash. Let it be you! What’s a right hook? Why does it happen? 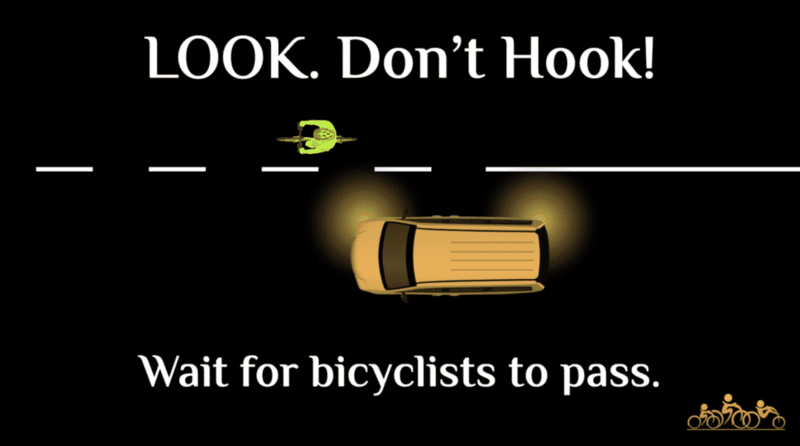 Typically, a right hook happens when a motorist passes a bicyclist and then turns right. As you see in the video, there can be a good bit of time and distance between the pass and the turn. But here’s the problem: The speed differential is not that great. Bicyclists are faster than you think. This is even more true with e-bikes. As a motorist, once you pass, the bicyclist is out of sight, out of mind. But what if you’re turning right up ahead? You have to slow down. The tighter the turn, the more you must slow. As your car slows, the bicyclist catches up. You both end up in the intersection at the same time. Why are bike lane lines often dashed before intersections? They’re supposed to be. * Drivers must turn right from as far right as practicable. Before turning right, you’re actually required to merge your car into the bike lane. If your vehicle has a long wheelbase, it may not be possible — or practicable — to make the turn from that far right. It’s also counterintuitive to merge into a space that’s a fraction the size of your car. But that’s the rule. Merging requires you to signal and scan to make sure it’s clear to move right. Once in the bike lane, if a fast cyclist approaches from behind, she will either need to slow and wait, or pass on the left. If you can’t merge into the bike lane, due to vehicle size or because of the speed and timing of an overtaking cyclist (as in the video above), you must yield before turning. Signal, wait for the cyclist to pass, and continue to scan behind you until it’s clear to turn across the bike lane. Don’t forget to check for pedestrians in the crosswalk, too. The chain of events for a right hook crash can be broken at any point, by the motorist or the bicyclist. It’s not that hard. But never lull yourself into thinking it’s easy. Thank you for being an Awesome Driver! *Except in Oregon, where bike lanes are not considered part of the roadway. Motorists may not merge into the bike lane, they must yield before turning right across the bike lane at intersections and driveways. 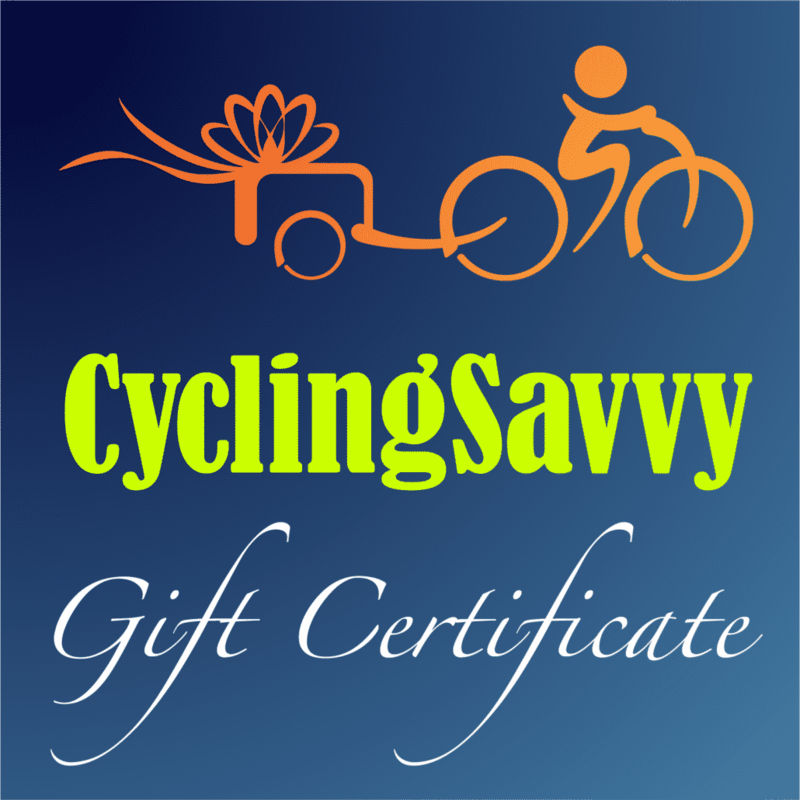 https://cyclingsavvy.org/wp-content/uploads/2019/02/Screen-Shot-2019-02-11-at-8.55.35-PM.png 2134 3826 Keri Caffrey https://cyclingsavvy.org/wp-content/uploads/2018/05/cs-xlong-header-01.png Keri Caffrey2019-02-13 15:00:422019-02-13 07:45:19Motorists: Look, Don't Hook! 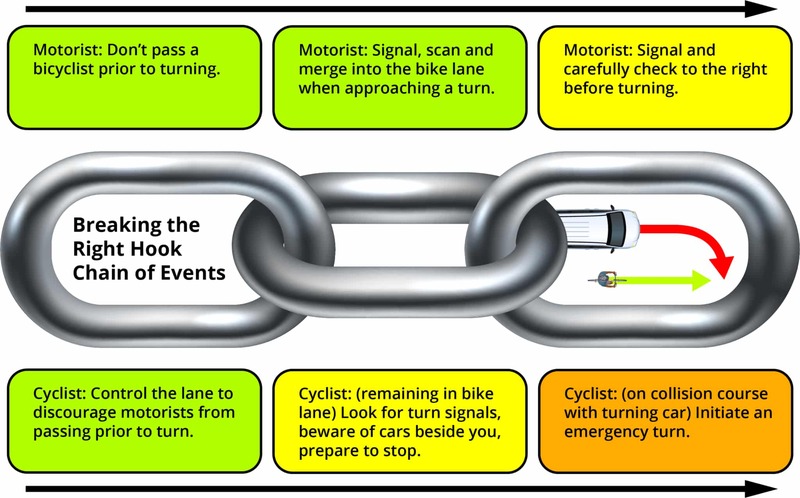 Thanks Keri for this important information not only for motorists, but cyclists too! How useful would it have been for all roadway users, prior to the charity ride I participated in last weekend! Great video! I would have appreciated a better demonstration by the driver of moving over more from the cyclist when passing especially given all the room on the road at that point in the video. I think we would all appreciate MV’s moving over when we’re out there riding in bike lanes (which many times are wayyyyy too narrow to be safe from passing vehicles that don’t move over, especially larger vehicles like buses and trucks), but other than that it was really well done.